Prior to going vintage, I've spent more money than I'm willing to admit on many different modern machines. I've tried everything ranging from bare bones Singers, budget Brothers, mechanical Berninas, and computerized Janomes. I remember feeling completely overwhelmed with machine choices when I first started getting into sewing. Like with most other purchases, I waded through myriad of reviews online. What I found was that even after countless hours of research, I'd constantly get sucked into feature creep--drawn by the allure of more stitch patterns and more automatic features. And while all of this sounds terrific in theory, I found out (the hard way) that I didn't need or even want these features in practice. In fact, sometimes, just having those extras can make basic functionality on your machine less practical to use! Take my Janome Memory Craft 6600 for instance. It is a respectable machine with a 7.0mm wide zig zag. The zigzag can be adjusted in .1 mm increments. Sounds fantastic on paper. In practice, I need to push the button 10 times to adjust from zig zag of 5.0mm to 6.0mm and 20 times to get to 7.0mm! Sure, if I hold the button down to adjust it and if I wait long enough, it'll accelerate on a curve to get from 5.0mm to 7.0mm but it is so slow. This, to me, is just a waste of time when I could be flipping a lever or pushing a button twice (like on a lower end Janome 7330 Magnolia) to adjust the width in .5mm increments. Vintage or not, what I found was that there really is no substitute for an extensive test drive. Establish what type of project you want to sew and make some samples on the machine. What feels good to one person may not necessarily feel good to you. And while that's what I did when I bought the 6600, I was too caught up in all the other bells and whistles to realize that the stitch width selection would bother me so much down the road. Knowing what I know now, I would not have made that purchase. That being said, all the testing in the world won't find you a perfect machine. It just doesn't exist. No one machine will do everything well. Generally speaking, the more versatile the machine, the poorer it performs on specific tasks, so don't be surprised if you need to make a few compromises in your search for your dream machine. To help avoid feature creep, I can't stress the importance of compiling a list of essential features that you want and sticking to it. This will be the start of a multi-part article where I'll highlight individual components universal to the vast majority of lockstitch machines so that you can decide for yourself, what's important to you. This has been the only way I've been able to control my obsession, and I use the term "control" very loosely. Without further adieu, let's dive into it shall we? These puppies come in all shapes and sizes. While it's easy to take them for granted, this along your needle plate and presser foot pressure are arguably the most important factors in determining how well your machine handles fabric. Vintage zigzag machines often have a 3 feed dog configuration: one long feed dog on each side of the needle opening and a shorter (and sometimes wider) feed dog just behind the opening. Sometimes the rear feed dog will be split into two narrower feeders (see middle image). For the purpose of this article, I'll treat both of those feeders as one unit and call that system a 3 feed dog configuration as well. While common, this configuration isn't the best in certain applications. When sewing forward, you can imagine that all 3 feed dogs work in tandem pulling the fabric back. However, when sewing in reverse, there is no central feed dog in front of the needle hole from which to pull the fabric, what this means is the rear central feeder is pushing the fabric forward to facilitate reverse. Depending on your fabric weight, this may cause your fabric to bunch up slightly. You can imagine a similar situation occurring when sewing near the edge of fabric with a small seam allowance. This is when a 4 piece feed dog really comes in handy as it gives an even feed both in front and behind the needle opening. There is, however, one application where the 3 piece feed dogs do excel. When doing wide zigzags (going forward only), the added support in front of the needle really helps prevent puckering of your fabric and will often require less tension adjustment to achieve a perfect stitch. Bernina zigzag 3 piece feeder. Saw tooth. Kenmore zigzag 3 piece feeder (split back). Saw tooth. Elna zigzag 4 piece feeder. Diamond. Coarseness of the feeders also plays a large role in how it will feed. Coarse, however, isn't always good as it can mark some fabrics. There are two dominant textures found on feeders, the saw tooth feeder which feeds slightly better going forward than reverse and the less aggressive diamond feeders that work equally well in either direction. For garment construction, I'm a big fan of the feeders in vintage Elnas because they use the 4 feed dog diamond configuration. Pfaff zigzag 4 piece and 3 piece feeder. Saw tooth. Singer straight stitch 2 piece feeder. Saw tooth. The width of your zigzag often determines the width of your feeders. Remember, the further your feeders are set apart, the more difficult it is to handle curves. This is one of the reasons why the straight stitch only machines handle so beautifully. 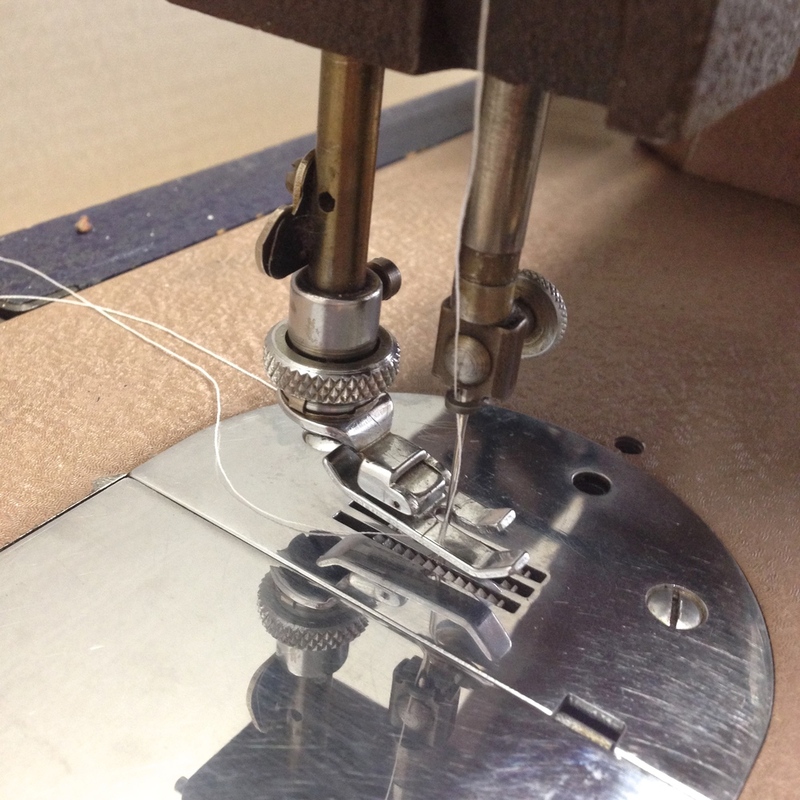 Utilizing a single hole for the needle opening, you'll often find a 2 piece narrow feeder. If you imagine a semi-truck trying to turn a corner vs a motorcycle, you'll start to get the idea why straight stitch only machines perform so much better than zigzag machines. It goes without saying, using a presser foot that matches your feed dog width is a must. This is the danger in using after market presser feet that weren't designed for your machine. Just because a foot fits on your shank doesn't mean it is compatible with your machine. Feed dogs that don't perfectly align to your presser foot width often yield an uneven feed. An often overlooked feature, the needle plate--and more specifically, the size of your needle hole--can really make or break your sewing project. Fine fabrics have a tendency to get pushed into the needle hole on the down stroke of the needle bar. By changing out to a straight stitch only plate on a zigzag machine, you reduce the size of the needle slot significantly. This added support really helps to keep flimsy fabrics in line. A lot of vintage machines come with extra sets of needle plates and many higher end modern machines will have these available as an added option. Some machines even have quick change releases so you can remove your needle plate without the use of a screwdriver. Needle plate markings are always a plus, but in a pinch you can always use tape. Speaking of tape, here's a neat little trick. If your zigzag machine doesn't come with a straight stitch needle plate, you can always fake your own by putting a piece of tape over the needle opening. Puncture a hole in the tape by lowering your needle a few times via the hand wheel and you've just MacGyver'd yourself a straight stitch plate! If you're really serious about making a more durable straight stitch needle plate, you can always buy a spare plate, fill the entire needle opening with some epoxy weld and drill a hole for the needle. Once a standard feature on all sewing machines, it's really unfortunate that adjustable presser foot pressure has been done away with in nearly all but high end modern machines. It's all quite vexing as presser foot pressure is such an integral part to how your machine feeds. Fine tuning your presser foot pressure can help prevent fabric slippage and even puckering. A machine without an adjustable presser foot pressure is calibrated to work on a specific weight of fabric (most often a light to medium). It's worth noting that user adjustment may still be possible if you have access through the top. An example would be the Bernina x30 series which does not have an external adjustment but can be adjusted via a screwdriver if you flip up the lid. Quite frankly, I just won't use a machine that doesn't have adjustable presser foot pressure. That concludes part 1 of this series. Stay tuned as I dive into hook types, bobbin cases, tension adjustments, stitch types, cams and more! Click here to read Part 2 of this series.